I was holding off on writing this due to yesterday's extremely sad news (some of you know what that is). But then I realized I needed a bit of a distraction. Boy, there were some hits, misses and serious surprises this year! The Academy Award nominations for calendar year 2011 were announced Tuesday morning literally right up the street from In Sync (I love living here) and here is my take on what's up and what's out. I had two big reactions to the full roll-out. First, the most wonderful surprise of the morning was Melissa McCarthy being nominated for Best Supporting Actress in "Bridesmaids"! I was like' WOW' in the car as I watched on my iPhone while riding to work in seriously slow traffic. Loved the movie and was actually reading an article online about it's Oscar potential, even though a long shot because of the sometimes gross comedic content, and how McCarthy should be considered. Now that is a fact instead of speculation. On the disappointing flip-side of adulation, what happened with Albert Brooks?! MAJOR snub! Not cool. His incredibly evil turn in "Drive" was an absolute shoe-in. When the final Best Supporting Actor nominated actor was read (Max von Sydow in "Extremely Loud & Incredibly Close") there was a gasp from the audience, not as a distractor to Sydow's performance but clearly at Brooks' omission. "Hugo" beat out "The Artist" for highest number of nominations; 11. We loved "The Artist" as well as "Hugo" but I think amongst others in the Best Picture race, the little silent movie that could will bring home the top honors in a month. Speaking of the Best Picture race, where the hell is "Drive"?! Another serious omission for a movie that's toped every critics list in the country...AND a film we thought was incredible, stylish and cinematic with great performances. Ryan Gosling not up for Best Actor in either this movie or "The Ides of March" (which I still haven't seen yet)?...2011 was definitely his year and for the Academy to not acknowledge one of these performances seemed very misplaced. Glad to see Steven Spielberg's "War Horse" up for Best Picture, yet "The Adventures of Tin Tin" didn't come near the Best Animated Feature category. "Rango", maybe. "Puss in Boots"? O.K. I guess. "Kung Fu Panda 2"? I think we're starting to wear thin on animated films. "A Cat in Paris" and "Chico & Rita"? Huh? What? Who and what are those? Best Foreign Film....BLAH, BLAH, BLAH, fast forward! "Bridesmaids" scoring a Best Original Screenplay was another awesome surprise. Kristen Wiig must be seriously excited and this is now a category I'll be paying more attention to this year. Flight of the Conchords' Bret McKenzie being nominated for Best Song for "The Muppets"...Brilliant!! I know he's going to win! I'm amazed that Harry Potter did not get nominated above technical awards. Thought the Academy would look at the series as a whole and hand out some larger acknowledgements, ala "The Lord of the Rings" after "Return of the King" was released. Everything in this race looks good, even though there are a few like "War Horse", "The Descendants" and "The Help" I have not seen yet. Never been a big Woody Allen fan but I definitely need to see "Midnight in Paris". "Extremely Loud and Incredibly Close"....whoa, where did that come from! It's not been a critical favorite, I can tell you that. Michelle Williams in "My Week with Marilyn": LOCK! George Clooney will most likely take home the statue, but would love to see Gary Oldman receive his first gold. I am seriously rooting for Kenneth Branagh in "My Week with Marilyn" (and not just because I worked on the movie), but why does it seem like Christopher Plummer or Max Von Sydow will probably get this? Again, where the hell is Albert Brooks in this category?! Nothing would make me happier than to see Bérénice Bejo or Melissa McCarthy win. But in reality everyone might be surprised by Octavia Spencer. The question on the minds of movie fans is 'why isn't Andy Serkis being acknowledged for "Rise of the Planet of the Apes"?' I truly feel the same...but how would the Academy do so? Some might say the Best Actor category would shudder with the thought of someone not physically appearing in a movie being given a nod. Nevertheless, "Rise" has been nominated for Best Visual Effects. This HAS to win! Nothing else up for the award even touches what was accomplished with the realization of Caesar. AND NO F-ING "TRANSFORMERS"!!! I hear Michael Fassbender is amazing in "Shame" but he was somehow missed. Leonardo DiCaprio didn't get even a glance for "J. Edgar" yet I understand his performance is uneven and the movie is a bit of a mess. And one more time I'm going to say...Ryan Gosling, where are you?! Sounds like a bit of a lame excuse to me. Regardless, this is probably one of the most shocking omissions of the roster. The only nomination for "Drive": Best Sound Editing. That's IT?! Michael Shannon is missing in the Best Actor category for "Take Shelter" despite coming across like one of the front runners. I thought his performance was intense, yet the movie seemed to go on a bit long during some scenes. So there you go! Exactly one month from today is the big show and sometime between now and then we'll be going to the Kodak Theatre so I can do my annual walk of the red carpet. Cheers! We got an order in this morning to do a series of spots aimed at how many Oscar nominations "The Artist" receives in the morning. I've been working on two versions of one broadcast spot since 10am. The second one only now finishing up....at 12:30 in the morning!! Yes, this is kind of ridiculous. But the good news is I do get overtime. The Oscar nominations will be announced in exactly five hours and The Academy is one mile from In Sync. This is in the Samuel Goldwyn Theatre where I attended the screening of the restored 1927 film, "Wings" just a little under a week ago. I'll actually be driving by there in a few minutes and I'm sure the place will be buzzing in readiness. OMG...SOOOO tired and I have to be right back in here first thing in the morning! Still trying to catch up from the business of this past weekend. Our friends Paul and Emaly joined us for a screening of "Return of the Jedi" on Saturday evening before their return trip home to Australia. Paul had been here for three years working his way along as an editor. A few months ago he decided it was time to head back to the land down under with his wife Emaly whose continued to live in Perth this entire time. She's visited every six months or so and they've spoken regularly using Skype, but it's been long separation for them both. I met Paul during the "Back to the Future" 25th Anniversary Celebration over a year ago and we've been hanging out very regularly. He's been a regular fixture in the 10th Box as well, diving into a long series of screenings and crazy marathons with Rebecca and I. Now he and Emaly are, at this very moment, probably on their very last leg across Australia to arrive back home in Perth. We brought them to LAX last night after a hectic day of organizing bags, having a wonderful dinner prepared by Rebecca and watching one last epic movie together in the home theatre. Even though we're really going to miss them, I know they'll be starting a great new life back in familiar surrounds. Best of luck, you two!!! That pretty much sums up my elation for the end of a very...long...process; I got a new sensation. How crazy is it that my entire collection is on one 3TB drive sitting in front of me? Pretty crazy! Friday night and Saturday day I finished reorganizing and cataloging the VAULTZ cases that the entire collection has lived in. The discs, now back inside their respective DVD cases and box sets, have become merely stored back-up as opposed to actual playable media. One click movie viewing has completely arrived at the 10th Box and the first night of hands-free film enjoyment began Saturday evening as our friends Paul and Emaly joined us for a screening of "Return of the Jedi" before their return trip home to Australia (more on this in my next post). For the past two months the entire floor of the 10th Box had been covered with VAULTZ cases out of which I was procuring disc after disc during the continuous loading process. I cleaned up the entire room just in time for Paul and Emaly's last visit, having finished cataloging all of the DVDs on Friday night. that allows you to access any and all files on your hard drives (such as DVD content) similar to how you would with iTunes. After I tried it out here at work I can very happily state that it seriously blew me away!!! The entire set-up is customizable, plus there's an advanced application with even more bells and whistles. This is exactly what I was looking for to call up movies; an organized and aesthetically pleasing control panel with plenty of interchangeable eye candy! And that, True Believers, shall be the next phase. Certainly nowhere near as time consuming or logistical, but a much desired icing on the cake. We're here at the historic Egyptian Theatre in Hollywood waiting for "Mad Max" to begin followed by a Q&A with the man himself, Mel Gibson! This is a sold out screening and there are a number of people dressed in costume. Four people dressed as Max alone. THE DVD LOAD IS OVER!!! The time is now 10:09pm on Thursday, January 19. THE VERY LAST DVD from my collection has been loaded onto the hard drive via Mac DVDRipper Pro! "Rise of the Planet of the Apes" just finished and is now ready to be put back into it's keepcase. 'The Big Load'...as it came to known....is NOW COMPLETE!!!! God Almighty, who would have thought it'd take me TWO MONTHS to complete this obvious gi-normous task! A few more details about cleanup and the final cataloging tomorrow, but I just had to share the triumphant news. Now I can go back to actually taking time to WATCH movies in the 10th Box as opposed to slaving over a hot laptop every night and all through the available weekends! My "Red Tails" broadcast spot is now online! Check out my finished broadcast spot for the upcoming Lucasfilm release. A lot of back and forth occurred regarding music with the studio wanting more urban / rap and us pushing for a more action / adventure tone via a track entitled 'Unison' by electronica artist Porter Robinson. We won out and here is that track in the spot! There hasn't been much fanfare for this movie and Lucas just announced that he plans to retire after it's premiere. We'll see if he really means it this time. The WWII action / drama opens this coming Friday, January 20. Now! Today! This minute! This is the most important thing WE ALL must fight against! Don't think the web will go humming along unaffected by these Washington assholes forever! Congress has before it two bills that would censor the internet; PIPA and SOPA. Plain and simple, this has to be STOPPED!!! The internet must....MUST....remain a free and open highway of information, trade, social connection, movies, music, books, art, history, and one of the most important things of all: a place to speak your mind! Your mission today: Click on the image to SIGN THIS PETITION!!! Don't stop. Don't think. Don't get distracted by anything. Do it right now! STOP PIPA and SOPA!!! We're here at the Aero Theatre waiting for "Willy Wonka" to begin along with a special introduction by director Mel Stuart. Was really hoping LA would put on a 'pull out all the stops' 40th Anniversary event during the actual 40th year (2011) and I'm pretty shocked it never happened. I was even going to go so far as to have my own in the 10th Box because of the ball dropping that occurred. At any rate, we are replete with chocolate bars (I didn't think to pick up actual Wonka bars before the movie) and ready for Gene Wilder to take us to the land of wonderful sweets and treats! My January Q&A feast: Gary Oldman, Michelle Williams, Kenneth Branagh and (yes) Mel Gibson! January has become a major month for top line Q&A screenings. The Arclight is having a special week honoring Gary Oldman with his films "Sid and Nancy", "JFK", "The Contender", "Prick Up Your Ears", "Dracula" and the new "Tinker, Tailor, Soldier, Spy". For this movie on the final night, I learned that Gary Oldman would be doing a special Q&A. Gary Oldman? Q&A? I HAD to go!!! Quickly I got on the website to RSVP free tickets (click on the image to be taken there) and found myself in luck that it had not sold out yet (it is now). Pass through the end of the last week of 2011 and into the new year. Rebecca and I are on our way to see "The Adventures of Tintin" this past Sunday when suddenly a Facebook message comes in from our friend Paul. He asks about trying to get together for a movie night or two before he and his wife Emaly move back to Australia in less than two weeks from now. I met him at the "Back to the Future" 25th Anniversary event a little over a year ago. In the message he also just happens to mention that he'll be attending a "Mad Max" triple feature screening plus a Q&A with Mel Gibson! O.K. yeah I know, Mel's integrity and moral standing is in very low regard these days and I completely understand why. But c'mon!! This is the man who personified The Road Warrior!!! on my iPhone, hoping and praying the Max-fest had not sold out yet. This is at the Egyptian Theatre location of the AC, BTW. With the quick stroke of a few virtual buttons I found myself happily on the way to the finish line of buying tickets. YYYEEESSS!!! We were IN!!! But wait, what's this? 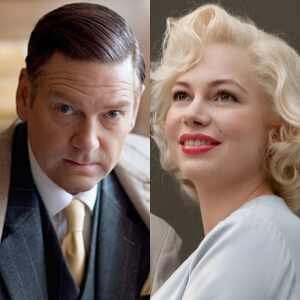 January 11 the Egyptian was also screening "My Week with Marilyn" plus a Q&A with Michelle Williams and Kenneth Branagh. AAAAHHHH!! Quick, buy more tickets!! Not sold out....SWEET!!! However, quick excitement about our triumphant movie-going coup turned into a minor 'whoops' twenty four hours later. Turned out the "MWWM" screening was the same night as the Gary Oldman Q&A. Taking into account that we'd just seen "MWWM" in the theatre (plus the fact that I'd recently worked on it and practically knew the move like the back of my hand) we opted to stick with Oldman for which I had quite a bit more excitement for. Yes, Michelle Williams will undoubtedly go home with an Oscar for her role as Marilyn Monroe, I have no doubt....as might Kenneth Branagh for his perfectly spot-on take of Sir Laurence Olivier. These were even more reasons why I hated to bag out of this event! But Oldman and another critically-praised new movie won out. So Rebecca will be heading to the Arclight much earlier than the 8pm start time for tonight's screening because it's general admission. That's right, no reserved seating as I've become so accustomed to. There could be a healthy line and I want to make sure we get the best seat possible! When I get out of work at 6 (I already cleared with the powers that be here that I HAVE to leave right at 6!) I'll be heading there as well to meet up with her. We returned about a week ago from our annual holiday trip to Upstate New York where temps hovered in the lower teens. I couldn't take time off the week after Christmas because four other employees had already put in for those days. The next available time was New Year's and into last week which I happily took it. Right off, here's the BIG NEWS....the last drips and drabs of my immediate belongs that were stored at my Mom's are now officially* here! WOOHOO!!! Rebecca had all 18 packages (including 4 poster tubes) shipped directly to her work. The first six boxes arrived last Friday and she'll be bringing over the remaining ones tonight. I originally envisioned a final load of 5 boxes in all. However it seemed safer to pack smaller boxes this trip as opposed to the three-smaller-boxes-in-one-large-box mentality from Christmas 2010. Last time the tops and sides of some of those larger ones were pushed in a bit. No worries though. Luckily I've always packed my stuff in inner boxes surrounded by peanuts, then the outside box around that. Everything has always arrived safely and I now count myself amongst some of the best and safest packers since my lengthy experience of moving all my belongings from one coast to the other. Going back to work last Thursday turned out to be more hectic than I anticipated. I was immediately slammed with a new Oscar broadcast spot for "My Week with Marilyn" and some changes on a spot I'd cut for "The Best Exotic Marigold Hotel" (yes, this is my first official reveal of that project). The "Marilyn" spot went to finish by end of day Friday, where at that point I was SO ready for the weekend! Then the cold and fever set in. The rapid change from Southern California temps in the 80's to 11 degrees with a wind chill factor of 0 - 5 in Upstate New York, then back to 73 degrees when we got off the plane back here in LA played complete havoc with my system. I was sniffling and sneezing and blowing my nose every 5 minutes. It was good to rest over Saturday and Sunday but when Sunday night arrived and I seemed to be getting no better, I took it upon myself to take Monday off from work for just one more day of rest. The extra time definitely did wonders for my health....AND I was able to load a substantial number of DVDs onto the hard drive! Today I feel much better, plus it was a pretty easy day. Ready to head home in 45 minutes!